Students sampling at the Fairy, Imperial, and Spray Geyser thermal sites. The RLMO project provides the basis for a variety of educational opportunities for secondary level (8-12th grade) and university level students. RLMO partners with several organizations in this endeavor including Western Adventures in Math & Science, Upward Bound, Oregon Gear-Up, Saturday Academy, and Junior Academy of Sciences. Original material derived from our current research describing newly discovered bacteria from hot springs in Yellowstone is used to provide hands-on learning. Learning methods in this course work include definition of microbial diversity, microbial identification techniques, and current DNA extraction and sequence analysis. All research is conducted by undergraduates in the context of new, improved research-driven coursework in Molecular Biology, Microbiology, and field-based Molecular Microbial Ecology (estimated impact = 80-100 undergraduates per year). The addition of a full-time education coordinator to this project facilitates improved education outreach, establishing a series of on-campus RLMO-based workshops for both pre-college secondary students and secondary science teachers (estimated impact = 100-150 individuals per year). Ongoing affiliations with Western Oregon University's education majors and Upward Bound, and a growing network with local educators is served by these program improvements. 5 Weeks of Undergraduate Computational Biology Curriculum - lecture/lab. Given that computational skills are central to many sub-disciplines in biology, we developed an undergraduate course called Computational Biology to better prepare students in this widely-applicable field. In this report, we have summarized available resources and original protocol for computational curriculum, all of which have applications beyond microbiology. We have also described specific microbial models that were uniquely selected and employed for class analysis. Using diverse microbial sequences and genomes, students navigated the National Center for Biotechnology Information (NCBI) with an emphasis on database structure, data annotations, effective database searching, understanding genome data archiving and display issues, and using analytical software to identify and rank similar sequences. Next, using original bacterial 16S rRNA sequences from our Red Layer Microbial Observatory project, students assembled and aligned multiple sequence datasets using several tools on the Biology Workbench (BW). Using resulting 16S rRNA alignments, students produced and statistically evaluated phylogenetic trees. 10 Weeks of Undergraduate General Microbiology Curriculum - lecture/lab. The first phase of this curriculum development project took place in 2001-2, supported jointly by the Waksman Foundation for Microbiology and the National Science Foundation Microbial Observatories Program. Our initial Waksman Foundation grant was designed to develop a new course in biotechnology emphasizing bacterial diversity, DNA methods, and the use of computer technology in the classroom. The target audience for the main course, offered in Spring 2002, was biology education majors and secondary science educators. Over the summer of 2002, we offered three summer teacher workshops in biotechnology and microbiology. To read more about these original courses and workshops, click HERE. Curriculum and approaches from these original courses and workshops were so interesting and useful that I decided to make them the entire basis for our majors-level General Microbiology course lab (Bi331), currently supported by the National Science Foundation Microbial Observatories Program. 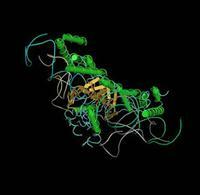 EDTA stabilizes DNA and inhibits released cellular nucleases. Lysozyme digests the bacteria cell wall. SDS, a detergent, gently disrupts the cell membrane. Phenol/chloroform, an organic solvent that forms a distinct lower layer when mixed with aqueous liquids, extracts most cell parts (including most proteins, membranes and pigments), leaving primarily DNA in the upper layer. Saving only the latter, we selectively precipitate the DNA by adding salt and alcohol. Pre-College Outreach Activities in Microbiology/Biotechnology. Our RLMO project provides the basis for a variety of education opportunities for secondary level students (8-12th grade), many in partnership with other organizations. Using original materials from our research on new hot spring bacteria from Yellowstone, we provide hands-on methods in microbial diversity, identification, and DNA methods (hands-on biotechnology and computer-based).